We recently caught up with Dominik Giestheuer from Austria, who has travelled to an impressive 49 races! After getting the F1 bug from his grandfather as a youngster, Dominik went to his home race at the age of 15 and has never looked back. Luckily, he has an understanding girlfriend. All pictures supplied by Dominik Giestheuer. Tell us a little about yourself and where you come from. “In the early 90’s I started watching Formula One with my grandfather, who followed all the races on TV. It didn’t take me long to start sharing my grandfather’s passion for the sport. I became a fan of Ferrari, because Gerhard Berger – an Austrian – was driving for the team at the time. I started pestering my parents to take me to a race, but they told me it was too expensive. In 1997, the Austrian Grand Prix returned to Spielberg, but it took two more years before my parents agreed to make my dream come true. Dominik with friends at Spa Francorchamps in 2014. What have been your most memorable races? What about your favorite circuit? Dominik with friends at Sepang in 2016. Any tips for fellow fans considering going to a race? Leave a comment below and tell us about your best race experience or send us a trip report. 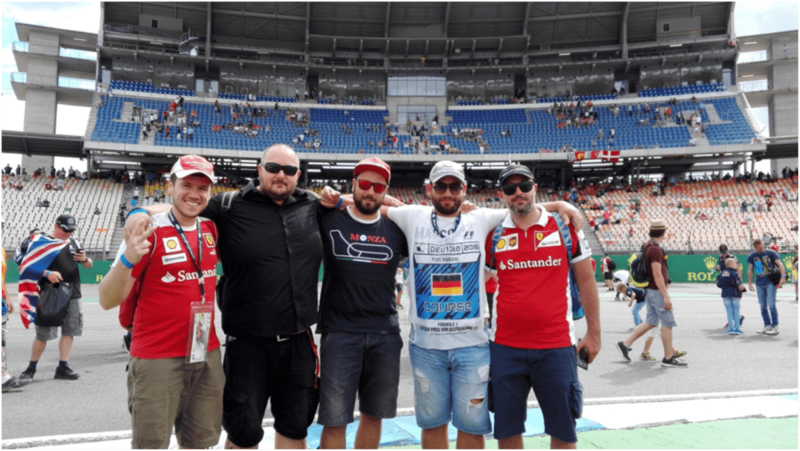 Read our earlier Travelling F1 Superfan interview with Marco Ragni from Italy here.